This image commemorates a performance of the drama Sao no Uta Kizugawa Hakkei at the Kado Theater 1829/7. 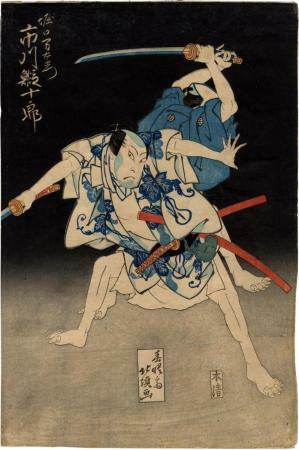 Illustrated in Ikeda Bunko, Kamigata yakusha-e shūsei, vol. 2, Osaka, 1998, No. 198. Notice that the main figure, Ebijūrō II, in the front, is wearing a garment that is decorated with stylized gourds among leaves and tendrils. This same outfit appears on Manemon in a diptych by Kunihiro and Shigenao. This costume hides a more subtle message in plain sight: the gourd is made up of the stylized characters for Ebijūrō's family name - Ichikawa (市川). The nature of the outfits in the whole triptych would indicate that this nighttime battle is taking place during warm weather - probably summertime. Not visible here are the other parts of the triptych. The dominant fellow, a ferryman, in the left-hand panel is using a large wooden oar or tiller to subdue his opponent. Although we know the name of the play we do not know the story line. However, we do know that it was written by the Osaka-born playwright Namiki Gohei I (1747-1808) and premiered in 7/1778. This print is from Ebijūrō II's last performance in 1829. He played the villain and fell ill during this time dying 11 months later, having never returned to the stage.